Scottish Heritage - Celebrate Your Roots is here written in Scottish Gaelic, and English, entwined around Jen Delyth's iconic Celtic Tree of Life artwork. The Montrose Shield and Lyon Rampant was chosen to represent Scotland and her people at the heart of the Tree of Life. Our ancestral roots reach back through history and generations as we celebrate the culture that continues to grow and evolve as a living tradition in our lives today. "Technically, the Lyon Rampant Standard and Arms are solely reserved for the use of the monarch - the King (or Queen) of Scots. However, since my known people seem to have been Jacobites and rebels all, I have never recognized the descendants of the House of Hanover (the current de facto occupants of the throne) as the rightful monarchs. Furthermore, Sir Iain Moncrieffe of that Ilk, the late Lord Lyon King of Arms for Scotland (Chief Herald, and formerly Albany Herald) once remarked that all living Scots (by which he meant native Scots, as opposed to others residing there) were descended from David I -- which means we all have a possible "claim" to the throne! There could be something to be said for that as well! Gaelic, like English, is an interesting language -- and the Gaels, being Celts, have some intricate ways of expressing themselves, often amorphous, sinuous, twisting and shape-shifting -- like their art, music, and myths". 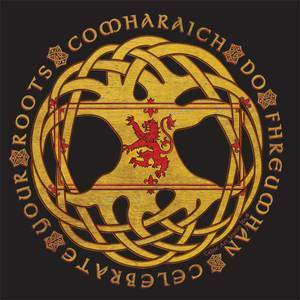 COMHARAICH DO FHREUMHAN is Scots' Gaelic for "Celebrate Your Roots"
Thanks to friends in Glasgow and Seamus for this special case translation, which required words that would give connotations of both botanical roots and familial roots. It required a "bardic" turn of phrase, using the old Gaelic love of double entendre and symbolism as opposed to a literal one. Dwelly's defines thus; pr pt a' comharrachadh, va Mark, point out. 2 Distinguish. 3 Observe, descry. 4 Remark. Comharraich iadsan, mark them.